Carrie Galbraith enters The Zone for the last time. This was the quote from Corinthians that was chosen out of dozens suggested by the 40 people crammed into Gary Warne’s Circus of the Soul bookstore on Judah St at 10th in San Francisco’s calm, prosaic seeming Inner Sunset neighborhood in January of 1977. It became a motto of sorts for the just birthed Suicide Club. The average age of those proto adventurers was around 27, the very same age of the famous dead or soon to be dead rockers of the infamous 27 Club. We weren’t blithely challenging death, foolish young people that we were, rather we were grasping at some pithy or even profound literary subheading for our newly founded, DADA influenced urban adventure/pranks “secret society.” The typical twenty seven year old does not have a friend or acquaintance die every week or so, and surely wouldn’t consider adopting such a colorful descriptor knowing it might actually challenge the reaper, insuring that he or she might have to pay then or at some later date. I harbor no regrets for that youthfully exuberant remonstrance, not yet anyway. With that said, the dying time certainly seems to be here looming bleakly over me, over us, black shadow of deaths hooded cloak darkening thoughts and days. When I started out on what was to be the ongoing wild ride of my life in San Francisco, I was a mere seventeen years of age. Within a year of being here, I fell down a rabbit hole and into the Suicide Club. As noted, most of that first crew of fellow explorers, pranksters and friends were, on average ten years or so older than me. Today, they and some of the other friends and co-conspirators I have accumulated over forty years of adventures are leaving this mortal plane much too frequently, for the spirit world or for the Big Sleep, depending upon your beliefs around such matters. One death in particular, has been far too ‘unimaginable for me to imagine’ – unthinkable in a way that has made it difficult for me to acknowledge it actually happened. She was way too important and fine a person to have passed without honoring her in some way, howsoever inadequate it might be. Carrie Galbraith was my friend, co-author, event collaborator and for thirty years a steady, calming, inspirational and encouraging presence in my life. Her pre-Cacophony life was one of physical and intellectual adventure. For years she crewed on big sailboats, travelling extensively along the California coast and beyond. She went to Venice on a Fulbright to study art and while overseas discovered Eastern Europe, the one region of the world that she was first and most intrigued by and soon to be most in love with. She studied and taught in Poland, Romania, Croatia and elsewhere in the thawing “Eastern Bloc’ as it slowly disengaged from the brutal embrace of the Soviet Union. According to her sister, Holly Carrie, around the age of nine read the whole set of the families World Book Encyclopedia (a fixture in any middle class home of the 1960’s, mine included) and when she got to Poland decided she would go there some day. At a later age, Carrie developed a fascination for Russian literature and filmmaking, prominently the film Stalker, Andrei Tarkovsky’s masterpiece of confusion, promise and sinister bewilderment. She loved the novel this film was based upon also – Roadside Picnic written by Boris and Arkadi Strugatsky, a novel that I suspect, is as dark and confusing as the film. The spectral imagery and seemingly nihilistic, yet almost spiritual essence of the movie is the setting for “Stalkers”, sort of illicit visitors to the forbidding Zone: trespassers and tour guides to this alien territory where physics as we know it is not in effect and the laws of science do not seem to apply; light is different as is sound, normal occurrences and movements are weighted with a strange dread, people that enter The Zone even with the assistance of the savvy Stalkers might never escape back to the world and their lives. Things can happen there: marvelous, revealing, terrible or even hideous things. Those entering take that risk, hoping for a revelation that will help define their world or a denouement impossible to accomplish anywhere else. Carrie was a primary organizer of some of Cacophonies most successful and more importantly, most sublime events. Along with Louis Jarmilowicz, Jayson Wechter and others, Carrie created three Exquisite Corpse theater events based on the old surrealist writing exercise. As opposed to most Cacophony events, these plays actually took place in active theater & performance spaces. Written by the audience just before curtain call, the weird synchronicity and group mind that was invoked was truly marvelous, and in my experience unprecedented. 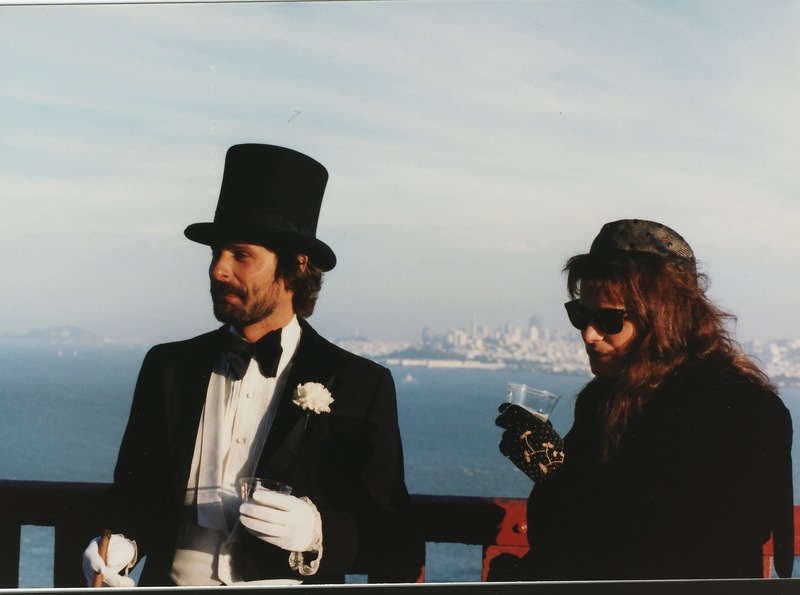 The first took place at the Haight Library, second at Noe Valley Ministry and the third and most ambitious at the Victoria Theater on 16th St.
Carrie conceived and was primary organizer of perhaps the signature Cacophony event, Atomic Café. Taking place in a huge underground Spanish American War bunker near the Golden Gate Bridge, dozens of Cacophonists dressed as nuclear war survivors and convened underground bewailing the end of the world. The bunker was faux finished, completely decorated and bejeweled as an actual café with red check table cloth seating, canned food, music movies, wall murals of important icons such as Frank Sinatra, Marilyn Monroe, atomic mushroom clouds, etc; group interactions, games, stories and all around end of the world bonhomie ruled the night. Outside, Federal police searched in vain for the “giant party” the knew was taking place somewhere in their curfew-ed jurisdiction, but simply could not find it. We had sound proofed the bunker, sealing it to the outside, making it impossible to find and equally impossible to enter should one find it. It was her Zone Trip that really changed the world though. She and fellow Cacophonist Phil Beweley (r.i.p.) found they had both grown up in the archetypal booring non-descript LA suburban enclave of Covina, the two being only a few years and unaware of one another at the time – thoroughly apart in their high school careers, yet absorbing the same blasé atmosphere. They determined that they must do some kind of event commemorationg the normalcy of this burg and their blandly typical SoCal upbringinging. This is where Carrie could really shine. She conjoined her love and knowedge of Stalker and super imposed the movie, the Russian novel it was based on, and all the otherworldlinessness of the Zone and the Stalkers that navigated it onto her childhood world, creating a strange and quite memorable road trip that was to resonate in ways none of us could have imagined. Eight of us drove to Covina in two cars, stopping along side the freeway somewhere near the Ventura exit around three in the morning. Carrie used a bent up piece of auto body metal to draw a line in the dirt which we all stepped across, ritually and metaphysically stepping into the Zone. After arriving in Covina around dawn, we passed out self addressed stamped envelopes (to mail back to the Cacophony PO box) with cryptic questionnaires to the early risers we encountered on the streets. We measured and explored odd implements, signs, park portals, building frontages and the like. We visited Carries birth home and performed curious rituals to the consternation of the current occupants. 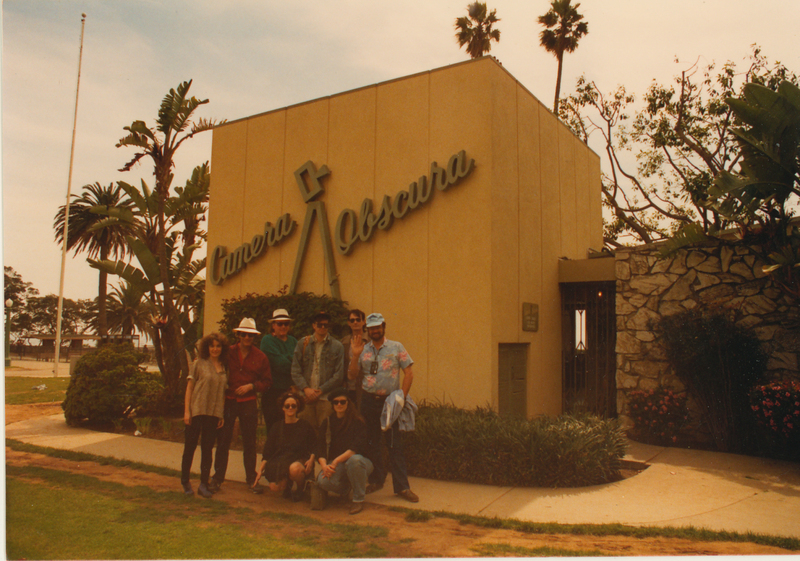 And, after having an Orange Julius when the small shop opened, sped off to the larger LA area exploring and discovering the weird and inexplicable things and places we ran across in our random, meandering tour. On the surface our expedition looked prosaic and most of what we did was not spectacular. What made the event, and the reason we repeated it a few months later, was the collective mind space we agreed to join into and the consensuce decision to view the environs we were exploring as a thoroughly alien place; a Zone where anything could happen. Yes, it was the LA Basin, a weird enough place without obscure Russian metaphysics superimposed over it’s spirit, but that group mind, agreed upon by all was implemented, shifting our consciousness into an otherworldly and never to be thoroughly explained experience of an alien landscape. The event was a life changing thing. The next Zone Trip was also to LA. We stopped at Magic Mountain Amusement Park, called the Church of the Subgenius radio show Puzzling Evidence at 4AM and then Michael Mikel drew a line in the dirt under the massive clown holding a lolly-pop and we crossed into The Zone again. The third Zone Trip was to the Black Rock Desert in September of 1990. Called The San Francisco Cacophony Society Zone Trip #4, Bad Day at Black Rock, (the mysterious missing Zone Trip was never confirmed but must have happened… making the two LA Zone Trips #’s 2 & 3) this event was the first Burning Man on the Black Rock Desert. Carrie Galbraith ‘s vision and art directly inspired so much of what Cacophony represented and informed the best of the Burning Man aesthetic and mysticism. She was our Stalker, even those of you who have never heard her name. Carrie drew the line in the dirt first. She and I had many discussions about the weird borderland between art and life, between serious aesthetic constructs and free spirited, unselfconscious play, between thoughtful observation and guileless freeform action while we were working along with Kevin Evans on our Cacophony compendium, Tales of the San Francisco Cacophony Society. Carrie Galbraith & Phil Bewley at Watts Towers Cacophony Zone Trip #2 1989. Organizers of the Zone Trip. Both are now gone. As a serious student, teacher and professional artist, she recorded and archived everything she made as an “artist”. Her one off, hand made art books, some of which are in museums and collections around the world, were meticulously documented and handled as the exquisite art objects that they are. But she only sparsely recorded her Cacophony endeavors, which she spent so much of her creative energy and time on for many years. To paraphrase from memory, she often told me: “It’s almost like Cacophony was so much my LIFE, that I never really thought to record it as I did with my ART.” With that simple observation, she nailed it for me as to what The Suicide Club and later Cacophony really were for participant/members and what early Burning Man offered to it’s community. Your art should be your life and your life must be your art.